Queensland’s Cameron Smith has officially confirmed his title defence and will tee it up in the Australian PGA Championship from November 29 – December 2 at RACV Royal Pines Resort on the Gold Coast. It will cap a big domestic summer for Smith, who’ll first play in the Emirates Australian Open at The Lakes Golf Club from 15-18 November before representing Australia at the World Cup of Golf at Metropolitan Golf Club from 21-25 November. Smith is looking forward to defending his first title on the ISPS HANDA PGA Tour of Australasia after a dream Australian PGA title win in 2017. “It was always one of my goals to win one of the big Australian tournaments, now the next goal is to obviously defend it and win back-to-back Australian PGA Championship titles,” said Smith, who made no secret of his desire to play the full summer of golf in Australia following his win at RACV Royal Pines Resort last year. This year has been a standout for Smith, highlighted by a 5th place finish at The Masters and four more top-10 results including consecutive 3rd place results in The Northern Trust and Dell Technologies FedEx Cup Playoff events. That led to a 12th place finish in the wealthy FedEx Cup rankings, making him the top performing Australian on the PGA TOUR this year. 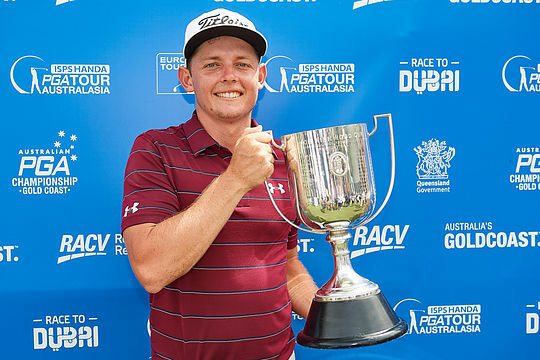 Since breaking through for his maiden title on the PGA TOUR and adding a home victory to his resume, Cameron Smith has played his way into the top echelons of Australian golf. Tickets to see Cameron Smith and Marc Leishman play in the Australian PGA Championship from 29 November to 2 December at RACV Royal Pines Resort are now on sale at Ticketmaster.